If you have a dog, then you’ll no doubt be spending more time outside together in the coming months. One of the great reasons to own a home is to have a big backyard you can share with your pets. But what if your dog is a little destructive? Or worse, what if your dog likes to get into things that might not be safe? Here are our best tips for creating a backyard oasis that is friendly to your best friend. Check out this great article for a more exhaustive list of plants to avoid. Nobody wants their dog trampling their beautiful flowerbeds. Although there are several types of deterrents out there, the best way to keep dogs out of beds is to provide interesting play areas. Does your dog love to dig? Then install a sand box that lets him dig until his little heart is content. Consider adding a water feature that your dog can play in on hot, sunny days. Is your dog a runner? Then make sure there’s a path or a large area for burning off all that extra energy. Let’s face it – even with the best design your dog is still likely to wander into areas you’d rather they stay out of. You can help yourself out by choosing plants and materials that will stand up to a little bit of abuse. Ornamental grasses are both soft and forgiving and can take a bit of a beating without looking shabby. In play areas and on paths choose materials that are safe for your dog’s paws, like bark mulch or flagstone. Avoid using cocoa mulch, which has the same chemical that makes chocolate toxic to dogs. Dogs can get sunburned just like people do. So it’s important to give them a shady spot where they can relax and get out of the sun. 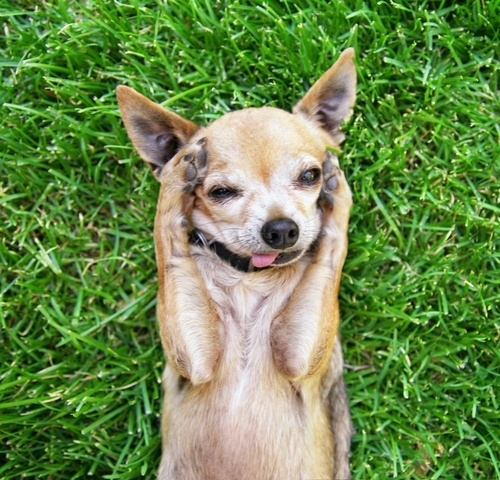 Dogs can also overheat easily, so it’s a must if you live in a hot climate. Give them some room under a shady tree, install a pretty arbor, or invest in a fun doghouse. And always make sure they have fresh water available to drink any time they are outside. Finally, make sure your dog is unable to escape from your yard. Sometimes, a fence alone will not be enough, if your dog is a jumper or likes to tunnel. Some innovative ideas to keep dogs inside where they belong is to create an underground barrier with chicken wire, line the ground in front of the fence with river rocks that are hard to dig, or use a slippery material for your fence like plywood.